Standing tall and proud along the shores of Lake Michigan, Point Betsie marks the southern entrance to the Manitou Passage. Its light has been protecting sailors and ships from maritime dangers since its construction in 1858. 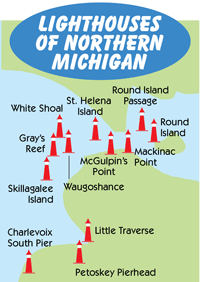 Timeless charm and easy accessibility explain why Point Betsie is one of the most photographed lighthouses in the state of Michigan. Parking your car just yards away from this beauty, you'll be welcomed by the sights and sounds of Lake Michigan. 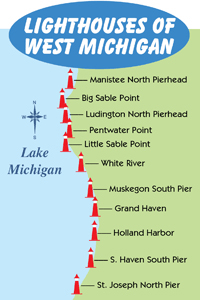 Nestled in a dune just south of Sleeping Bear Dunes National Lakeshore, the tower stands 39 feet tall, but with the height of the dune it towers 52 feet above the water line. 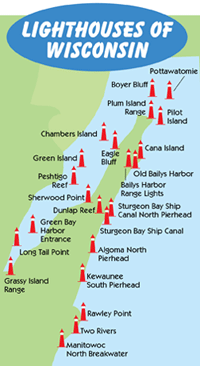 Point Betsie was the last lighthouse on the Great Lakes to be manually serviced, and was fully automated in 1983. The light could originally be spotted as far away as 27.5 miles with the Fourth Order Fresnel Lens it came equipped with. Upon automation the Fresnel Lens was replaced with a Vega VRB-25 system, which has a range of 15-22 miles. Today Point Betsie stands in quiet testimony to the many keepers who maintained the light while their wives maintained the household, tended gardens, and watched their children playfully explore the dunes. 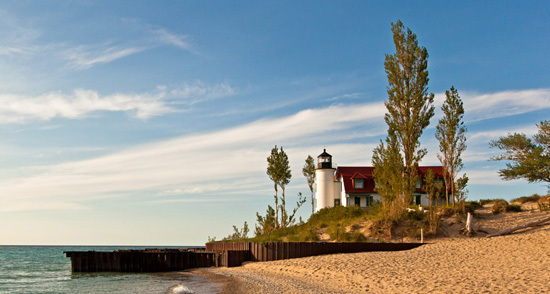 Listed on the National Register of Historic Places, and manned for 106 years, Point Betsie offers a fascinating visit for history buffs and those who just want to relax. Sporting the same paint scheme the lighthouse had in the 1940s, it has been preserved and is cared for by "The Friends of Point Betsie Lighthouse". 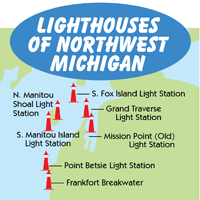 If visiting Frankfort, or Sleeping Bear Dunes in Benzie County, make sure to visit this historic lighthouse. Wander the grounds, explore the accompanying fog station stroll the beach, or have a family picnic. Adventure awaits! Article written by Craig Sterken Photography.